Running a massive deficit of hundreds of millions of dollars, Philadelphia’s school system is planning to eliminate all sports, extracurricular activities, counselors and libraries—beyond which, for schools eviscerated by austerity politics, there’s not much left to lose. At noon today, May 17, thousands of students are expected to walk out of class and flood downtown. 1. The pregame. On May 7 and 9, students staged two walkouts, the first with a few hundred students, the second with upwards of 1,000. The May 7 action was launched by an unaffiliated group, the Silenced Students Movement, over Facebook and Twitter. 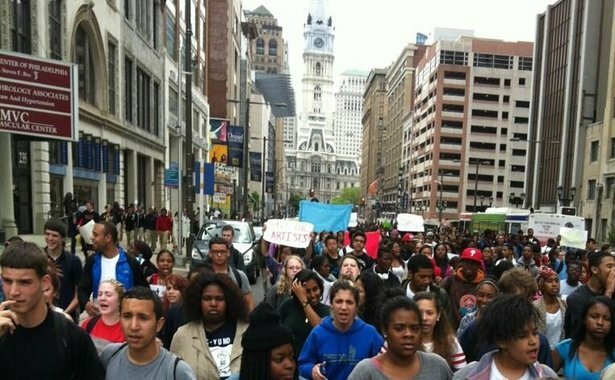 By Thursday, members of the Philadelphia Student Union (PSU) and Youth United for Change (YUC), the city’s largest student organizing groups, were in on the call. This time, students have the support of PSU, YUC and the broader Philadelphia Coalition Advocating for Public Schools (PCAPS). The coalition includes the Philadelphia Federation of Teachers, both student groups and an array of community groups and other unions. 2. The school closing shell game. The citywide uprising goes hand-in-hand with the city’s unprecedented, Boston Consulting Group-inspired maneuver to shutter public schools. In December, the city announced that 41 schools would be closed or relocated—a total that has since dropped to 23. Over the spring, students, teachers and allies have disrupted SRC meetings, blocked traffic, marched endlessly and released their own survey-based plans to revamp the school system. The district hasn’t undertaken the school-by-school community needs assessment that PCAPS is demanding before any schools are closed. Putting aside the dubious logic of “facility underutilization,” any labor savings from closed schools portend disaster for students and workers alike. And the students who are affected are more likely to be black or Latino. A handful of PCAPS groups, including PSU and YUC, are part of the Journey for Justice, a growing national movement led by people of color. The coalition’s demands pivot on the racialized thrust of neoliberal education policy; in some cities, groups are pushing federal civil rights complaints against school closings and related overhauls. 3. Receivership. City students and state leaders don’t exactly agree on issues of school funding. In response to protests against Governor Tom Corbett’s planned commencement address at Millersville University, state Department of Education spokesman Tim Eller said, “Unfortunately, those people believe the only support for education is shown by how many zeroes are on a check.” After a Corbett-proposed $1.2 billion in cuts to public education funding in 2011-2012, the state cut $860 million, or $410 per student. That year, Philadelphia lost 1,600 teachers and 2,100 other school staff. For their part, city spokespeople decry state underfunding—while, last year, bankrolling charter school expansion. Since 2001, the district has been run by the state-directed School Reform Commission (SRC). Hundreds of students walked out to protest the state takeover—enacted by the state legislature partly under the pretense of district budget woes. 4. School safety. When schools are closed, students risk crossing myriad social boundaries—including gang lines—to survive in their new environments. Through the Campaign for Nonviolent Schools, Philadelphia students are pushing for student voice in school safety policy. After a series of actions last summer, the campaign won a new, less punitive discipline matrix and protections in the school dress code for gender-nonconforming students. More recently, students successfully advocated for pilot restorative justice programs in ten schools. This month’s mass actions aren’t some hormonal release, but flashpoints in years of organizing. The Campaign for Nonviolent Schools is a prime example. 5. History. On November 17, 1967, more than 3,500 students from at least twelve high schools walked out and marched to the Board of Education. In conjunction with the Black People’s Unity Movement, students demanded black representation on the city’s school board, black history taught by black teachers and the removal of police from schools. Despite clashes with 400 cops—and 57 arrests—the walkouts drove the administration to open dialogue with students and allies over curricular reforms and community voice in school policy. Today’s protests, which land on the 59th anniversary of the Brown decision, recast the legacy of civil rights struggle.